In the example to the left Pigeon prevention was the best solution in double lightwell/school courtyard area. Pigeons could roost and nest in many concealed areas creating a large colony of pigeons over a short period or time. 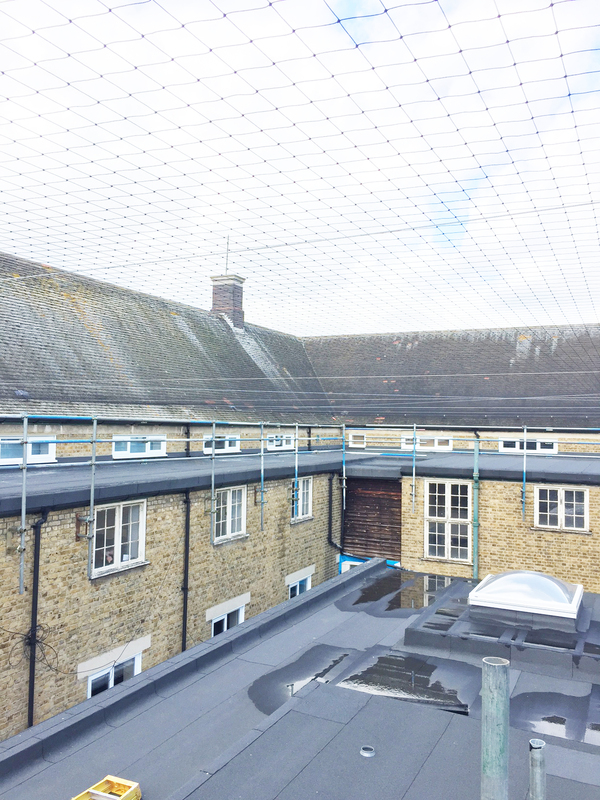 Before we could install the preventative fire proof pigeon netting we disinfected the entire roof courtyard and removed the pigeon guano and nesting debris. 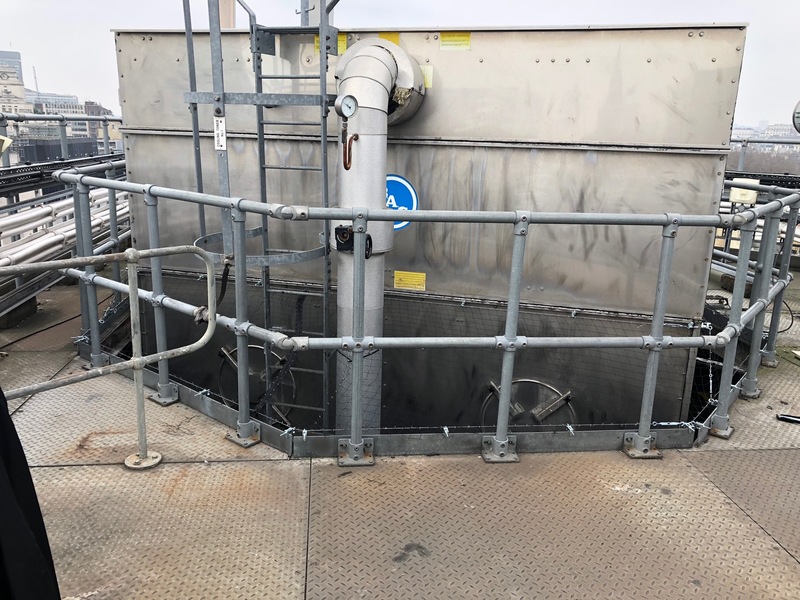 In this example to the right we have installed a fire proof 50mm black polypropylene pigeon netting to prevent pigeon perching and nesting on the roof steel supports as this was contaminating storage item below. 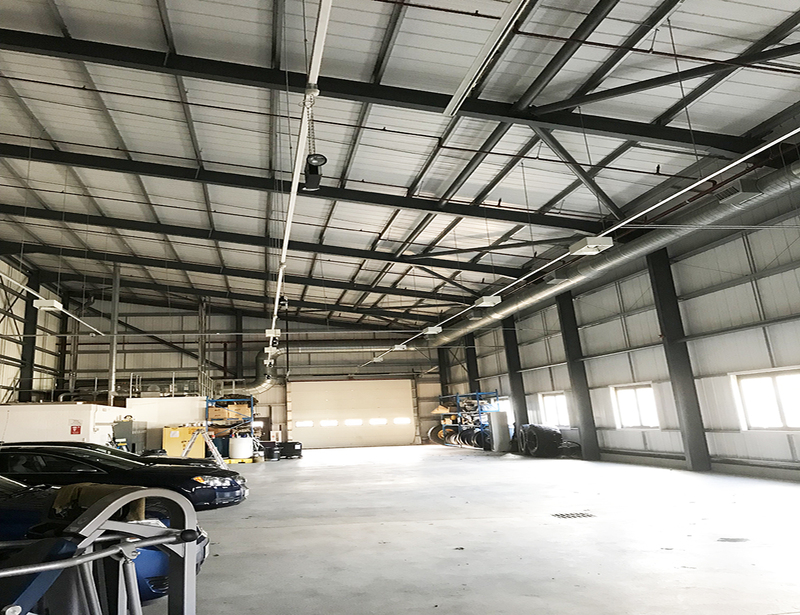 Pigeon prevention is unfortunately not considered until pigeons start nesting and roosting, thus colonising enclosures and contaminating areas that eventually become a public hazard, or a hazard to employees. In this example to the left pigeon prevention is vital for this cooling tower facility in the centre of westminster. Pigeon have entered the underside of the service area and nested and contaminated the conduit trays/service areas, so to prevent pigeons entering we fixed beam clamps to the stainless steel seems and installed a fire proof 50mm pigeon netting around the circumference of the floor plate to prevent pigeons from entering. Please call us using our free call number 08000 778 220 and book a free survey for you protective pigeon netting system installation.